Cameras being professionally cleaned… I decided to try to challenge myself to be more creative in post processing this week for halloween by consuming these "leftovers" in a creepy or macabre way.. I'm aware this isn't my forte, thus the growth experience. As a departure from yesterday's gory submission, I'm going to cheat and use an easy one. 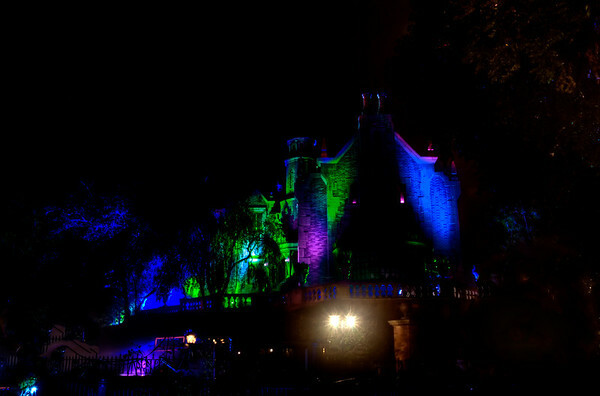 I thought we'd take a transition to the realm of "fun scary"
This is a not-that-great shot of Disney World's Haunted Mansion. On this day, it had been raining. The interesting thing about fake fog and rain is that the fog tends to get heavier and cooler, then hang around lower. I stepped out of the queue to try to get this shot. I don't like the angle on the mansion but based on the queue awnings, I'm not sure the better angles are photo accessible.